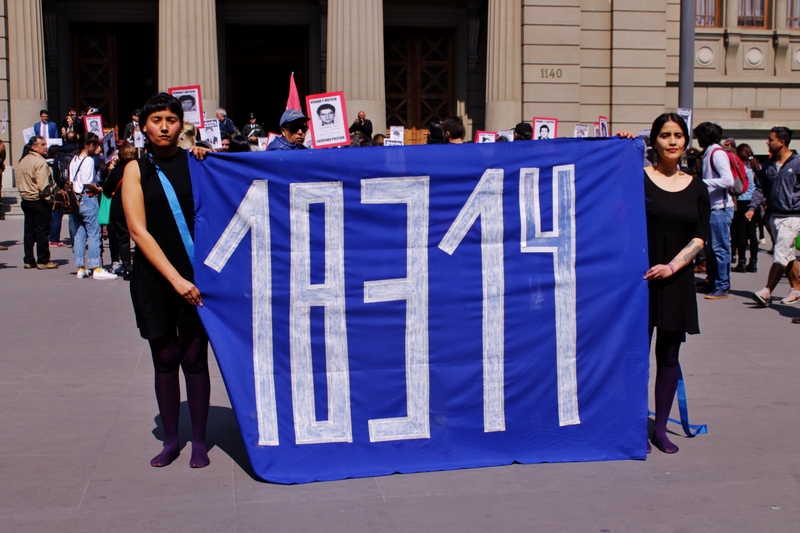 Less than a month, Daniela Catrileo performed in front of the Museo Precolombino and the law courts, the last performative action series regarding the Anti-terrorism Law 18,314, adopted in 1984. 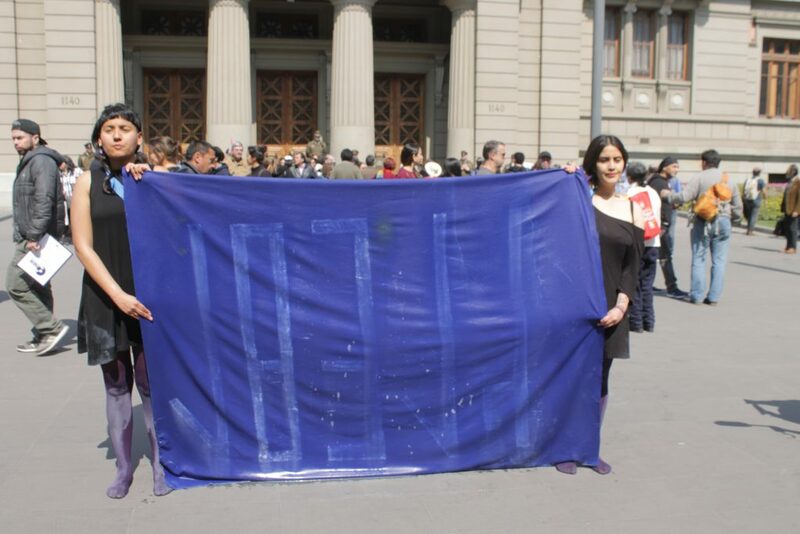 The core of this action was to erase, together with Paula Baeza Pailamilla, the said number on a blue canvas, as a complaint of justice facing the violence that this dictatorial aftertaste infringes on Mapuches mostly. This is just one of the searches in which Daniela Catrileo has ventured, always from a committed and collaborative work that interweaves literature, art, activism, philosophy and pedagogy. During the week she takes classes in a school, participated a few weeks ago in the X International Congress of Ethnohistory in Flacso Ecuador is part of the Mapuche feminist collective Rangiñtulewfü, held a Mapuche poetry workshop in the Cultural Center Palacio La Moneda and a Literature Workshop Mapuche in the Museum of Memory and Human Rights. In the last session of the latter and among her thousands of tasks, Daniela reviewed one by one the scriptural exercises that young Mapuche from Santiago have done week by week. While they share a coffee or a mate, in a museum underground room, they prepare the publication of a plaquette that collates her works. How do you connect your “teaching” work in these workshops with a way to create memory? For now I have created spaces for the visualization of Mapuche literature-let’s call it that for now-Mapuche writings rather, and all that that entails, because I wanted to propose the recovery of our memories or our blotted stories. I wanted to state that we have other categories to call certain scriptures, certain songs, which have always been, that the word is something important in the Mapuche people, which has been handed down from generation to generation. There is a will to make memory and that memory is part of remembering certain things and certain roles that in the Mapuche world are pierced by the word. The instance arises simply as the political desire to share what I learned, so that others and others do not get frustrated with the hegemonies of certain spaces of art or literature and make all micropolitics. For example, the trawün here, was a space to share as Mapuche, as young people if you like, but also as children of all this diaspora. We had many memories in common that, I feel that they must be present in these multiple histories of the territories that we inhabit. “We are in the constant questioning, that’s what it is, to ask ourselves what to do all the time, not to be still, to be always mobilized by something that is stronger than us”. That all of the workshop staff have unique histories of how they rediscovered their Mapuche root, sometimes more hidden, sometimes denied, or simply distant from they would say attracted my attention. How was your experience in this respect? How were you trained? My learning of the Mapuche writings is very self-taught; in fact if I was already inserted in the world of literature, I was interested in doing other searches there. There were common spaces where we were reading primordial authors, but I did not finish feeling comfortable, there were things that I like a lot, that I digested them, but I felt that there were no important stories. That made me reunite with brothers and sisters not only in art or literature, most of my friends Mapuche friends are like a constant trawün, in a nütram that does not end, recognizing us, but also problematizing. In those searches we had to recognize another type of knowledge and another type of knowledge, which we were denied for a long time. These come from talking to parents, with the older ñañas, but also making political resistance in cultural spaces, or such basic gestures as making an event and sending money to imprisoned lamngen. That is changing you, because there is a wound that is constantly throbbing, a constant violence, if one does not realize that horror it is very difficult for him to continue making art, other than in a hygienic way. From a traditional or colonial vision, the new supports, photographies, video or performances that you include to your work as a poet, they seem to withdraw from what Mapuche is, when they really seem to be rescued through orality, from singing and body. What relationship does this have with your Work with photographers, performances, and artists? We do not have a clear answer, I love it, as something that is burning, something that does not finish responding, we are constantly questioning, that is what we are asking, what to do all the time, not being still, being always mobilized by something that is stronger than us. For now, to that stronger, we are going to put memory, political practices, but exceeds those categories. I have been doing explorations for a long time and they have to do with ways of writing to me in different ways. Writing is a significant and profound part of my life, but it is because it is the practice that I started with since childhood, it is what was at hand, as Eliana Pulquillanca said today, we all had a paper, a notebook, a pencil, which was like the most practical tool to start a path. I have always been interested in collective works, I think that no matter how much one says that writing is something individual, I do not believe in that, we all carry many voices in our backs. It’s a translation, one is just a bridge. In the 18.314 series, there are certain recurring images: the tissue, the plaiting, the blue ribbons, but above all the bandage, which also works as a kind of gag with the number on it. It’s been said that it has to do with the parents’ silent, which also appears in Río herido poems. It starts from using my body on different ways. Something very present in my body is my hair, I have a long hair, in which way my hair is a tissue, they are strands of my body that are linked in another way to territories, with earth, with rivers. Plaiting has to do with a practice of Mapuche women that has been present in our history, plaiting another and as brothers through the tissue of our hairs. Last strands of our bodies. Of the number with the type of gag, I thought how to take silence through the anti-terrorist law: obviously the gag was the most practical image, but it is also very similar to a tralilonko, which is like a bandage. And it is also to write this number as the legal language. The gag was always thought of as a colonizing legal language, which is present and which is there emerging. There are other symbols that appear, blue ribbons, the union of these ribbons. It is recurrent to talk among ourselves about the silence of our families, which is not conscious and decided, it is a silence imposed and of survival as well. Thanks to that silence we are here. But how we resignify that silence and transform it into noise, into words, into agitation. That’s because we grew up with all that culture of violence and fear, of hiding who we were. Santiago’s places where the actions were developed are strongly charged of political implications, how did you choose them for actioning with your body? All this action begins with the hunger strike of the machi Celestino Córdova and the imprisonment of the Lamngen Tralcal, after the assembly Hurricane, leaving what the machi Francisca Linconao had lived. Although that is only the latest events, year after year there are some lamngen imprisoned, others being part of a montage. Then, I asked myself, in what way do I translate something as strong as a hunger strike into artistic practice? Nothing can resemble, that is the maximum performance, political, resistant, be transforming your body to demand justice. What one does is just a gesture, a small scratch on something higher in which they are all. I was invited by a group of mapuche students, from chillkatufe, to do something in the feminist outlet of the Faculty of Law of the University of Chile. There she prepares something: instead of reading, I want to do something else. If one looks well the circle closes like this, part in Law and closes in Courts, but I did not think so, it was happening, intuitively they are presenting the signs. To the filmmaker Rocío Chavez, who was making a documentary about ñañas, of Mapuche women, it occurred to her that I was reading next to the river. I wanted to do more than read next to the Mapocho River. This is how the second part of the exercise came about. Before the last one there is an action that has to do with a tattoo -made by the artist Claudia Kelevra- and it has to do with subverting the number of the anti-terrorist law, translating it into the Mapudungun and that translation writing it on the skin. The number already from our voice, resignify it, cross it out. The last action that we were working on from the collective, with Rocío, Claudia and I wanted someone to appreciate from friendship, but also from political and artistic admiration that is Paula Baeza Pailamilla. Many of the Ayekan and Mapuche concentrations to demand justice are done right in front of the Courts. At that time, I was doing the workshop in La Moneda so a few days before I went there and there was the Pre-Columbian Museum, which is like a bridge between the private and the public, it has many treasures, from several Latin American territories. It seemed interesting to us that our bodies were outside the Museum, because in other countries the indigenous bodies are exposed in the museums or they are at the exit of the museum, where they sell their art, their works, which also sell inside but for three times the price. In Chile sometimes, it seems that we are so crossed out, like that they are not even in the city, as it is recognized as indigenous, as native peoples. I told Paula “let’s sit there for a while, see what happens”. We came up with braiding one another, to twine an umbilical thread that joined our braids. I wanted to make a pilgrimage to the Courts, so it occurred to me to drag Paula from the Museum to Courts. Show that body that crawls. To the inhabitants of Santiago who pass by, the clerks mostly, what they thought when they saw two women crawling, marching with a number. Some think it’s the death toll or they start asking questions. We as a people are the only ones who know what that number is in a more present way. The other thing that interested me was that the water was present, as I had worked in the river, as my name implies the river, I feel that I am full of water and that the waters also write to me. That Ngen, who is the owner of the rivers, how can be transformed. I took a kind of blue bucket too, and we started to wash that same canvas, in that water. Wash the number, delete the number with that same water. At the Memory Site -Ex Santa Lucia Clinic- I knew that perhaps a reading was not going to be as powerful as other gestures that can be made, from the writing itself, how to put these other bodies that are super present for us. We can name three, four, five Mapuche dead, something that did not end in 1990 and extends until today. We all have dead in our families. What do you think about the always present danger of co-opting or appropriating of what is Mapuche property on the part of artistic institution? How do you consider m resistance in front of this attempt of codifying, explaining or erasing the Mapuche identity? It is the danger of an economic system that tries to transform resistances into fetishized, folkloric places. I think it’s difficult, but it’s not something we end up answering. We can only do it in practices. As not everything can be appropriated by these places, the idea is that we also think about those places, without separating thought from action. When making art, it may be emerging from the body of the territory, from what I think. I’m not doing it for an academic to talk about me in a congress, I’m going to that congress. Against these images with almost an ethnographic eye of what we are or should be, why are we in the ruka, why are we not doing a witral in this way, because we do not speak everything in Mapudungun. We are always putting a few canons, that we exceed, we consider ourselves in that constant becoming asking ourselves about the identities themselves, transforming them, inhabiting that border. That is why I am interested in retaking, not only the Mapuche but also the Champurria, how the champurria does not fall into all these categories, the champurria will never be appropriate for the Chilean. It is always thought from the Mapuche, it has a Mapuche memory, it is delimited by a space of identity clash. I am no longer so respectful with those voices that want to investigate us all the time, before I looked at him with a little more ingenuity but less and less. And for that, it has served all the trawün and conversations about how we consider decolonization as a permanent political practice. All the Mapuche are informants of theses of places because with luck we know where they are going to be published, but as the cultural appropriation or the anthropological image of our bodies, they are no longer the indigenous museums or the human zoos, in some way that conversation of the other , of civilization and barbarism is present. In the end it is the question of permanent colonialism, one realizes that these classist, racist practices are present in many spaces, in the academy it is one more. We must try not to fetish ourselves, but to exceed what they try to pigeonhole us.